The police chief for the Mesa, Arizona police department said he was "angry and deeply disappointed" after what he saw in surveillance and body camera videos this week, which have called into question the department's use-of-force policies. In total, seven of the department's officers have been placed on administrative leave over the last several days. "The actions shown on that video and others recently released do not reflect the values of the Mesa Police Department," Chief Ramon Batista said at a Friday afternoon press conference. "I promise you, we will fix this." Three independent investigations have been launched, including a potential criminal investigation handled by the Scottsdale, Arizona police department, as well as an independent investigation by the Police Executive Research Forum, a nonprofit police research organization. The investigations stem from two separate police calls that happened in May 2018. Both incidents did not become public until this week after the Mesa Police Department released the footage and announced the investigations. In the first incident, Mesa police officers responded to an apartment to investigate a domestic violence call where a woman reported her ex-boyfriend was trying to break in. When officers arrived, they encountered two men. One man, identified as 20-year-old Erick Reyes, the ex-boyfriend of the woman, was ordered to sit down. He complied, police said. They also encountered Robert Johnson, 33, near an elevator. Surveillance video showed officers searching him near a railing while he is on the phone. They then reportedly asked him to sit down on an opposing wall. Instead, Johnson leaned against the wall. After that, the video shows multiple officers punching the man until he falls to the ground. The second incident involves a 15-year-old teenager suspected of committing a robbery while armed. Surveillance video shows an officer grabbing the jaw of the suspect. During a Friday news conference, Batista said the incidents are "disturbing and will not be tolerated." 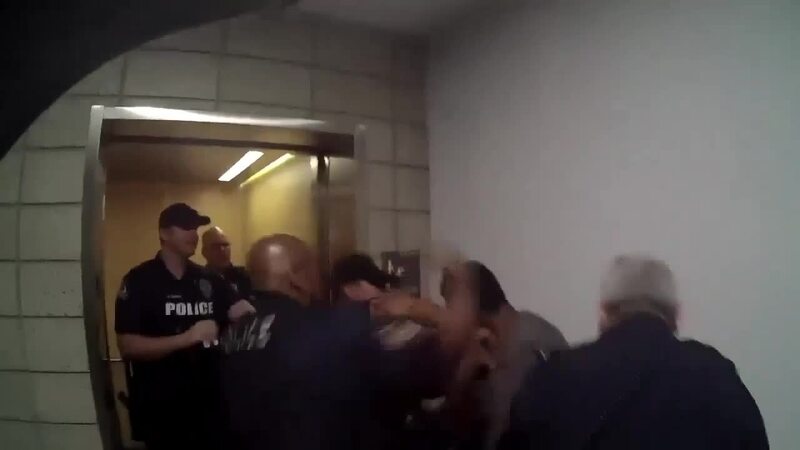 The questions about his department's use of force come as officers across the country have been scrutinized over interactions with potential suspects.